The new Mercedes-Benz C-Class range is now available in the Kingdom of Bahrain exclusively at Al Haddad Motors. With a stylishly bolder appearance and powerful performance the new C-Class range is the embodiment of modern luxury. 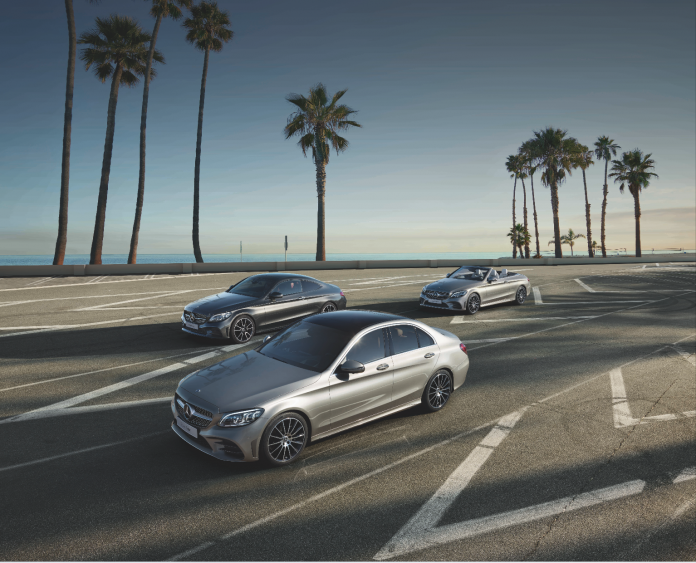 The C-Class family has something for everyone. Whether you are in the market for a family oriented vehicle or you want to make a statement in a bold design the C-Class family is sure to satisfy your needs. The C-Class family includes a C-Class Sedan, Coupe and a Cabriolet. Sportiness and driving pleasure have been enhanced with a sharper design, digital cockpit and DYNAMIC BODY CONTROL suspension. The new four-cylinder engines with increased performance underscore the dynamic nature of the C-Class. The sporty diamond radiator grille, flowing lines and distinctive shoulders show the C-Class in top form. The new C-Class is lighter than its predecessor with intelligent lightweight construction and a higher proportion of aluminium. At the same time, the body is a lot stronger, because of the use of high-strength materials. All the new features harmoniously come together to produce a car that’s enticing, sporty and super luxurious. The interior of the C-Class is designed to perfection. Your gaze sweeps over the car and it leaves nothing left to be desired. The new luxurious features include four seats made with premium upholstery, high quality materials used throughout the interiors and impeccable finishes. These features along with the ambient lighting, give the car a very classy lounge like appearance. The C-Class has a new display concept which includes an optional, fully-digital instrument cluster with the three visually distinguishable styles “Classic”, “Sport” and “Progressive”. The C-Class also has touch-sensitive controls in the steering wheel. They respond to swiping motions like the screen of a smartphone enabling the driver to control the functions of the instrument cluster and of the entire infotainment system without having to take their hands off the steering wheel. The new C-Class features the latest Mercedes-Benz driving assistance systems offering the driver cooperative support and providing a higher level of active safety than its predecessor. The C-Class is able to drive semi-autonomously in certain situations by keeping a close eye on the traffic situation with improved camera and radar systems which allow it to see up to 500 m ahead. The new C-Class comes with extended Active Brake Assist as standard which depending on the situation can help to mitigate the consequences of rear-end collisions. For more information, please contact the Al Haddad Motors showroom on +973 17-785-454.